In 1819, Britain was able to create a dedicated West African Squadron, with half a dozen ships. Its strength grew to a dozen or more in the 1830s and upwards of 20 after 1840. International treaties gradually expanded enforcement rights until by the mid-1830s any slaver could be taken. Britain itself emancipated its last slaves in the West Indies in 1834. Small, shallow-draft brigs, not much larger than the slavers they set out to catch, were best suited to this duty. 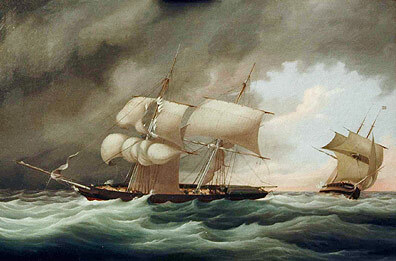 The Admiralty began replacing its aged small vessels with new classes of nimble brigs in 1828 and 1834. The Navy also turned suitable captured slave ships into vessels sent out to capture other slavers. By the 1840s, steam powered warships became common and were well suited for the West African coast. From 1850 on, there were never fewer than eight steamers on station, and by 1860 the squadron was only steamers. Here one of the Royal Navy’s brigs is in hot pursuit of a Baltimore clipper-style brig. The painting, bought in Britain, came to Penobscot Marine Museum in 1962 with no information other than the artist’s name, E. Poulson. Poulson’s paintings are rare. They appear in few museum collections. He seems to have been a retired master mariner, possibly a Royal Navy officer. In retirement he painted from about 1840 to about 1865, living in Sunderland, on the North Sea near Newcastle. As a seafarer or naval officer, he could have witnessed such a chase as this and been one of the British officers. Poulson would have seen lithographs published by the artist W.J. Huggins who depicted a number of incidents in the anti-slaver war in the 1820s and 30s in his print series. Huggins was tremendously prolific, and his lithographs were popular. In 1830 he was appointed royal marine artist. But his work is quite static; Poulson’ painting is far more vibrant, and he may have hoped to achieve commercial success selling it to a print maker. The scene is fascinating. It’s a dramatic moment in a despicable business. A black squall, possibly assisted by a naval cannon ball, has just split the slaver's fore topsail. Men are racing aloft to take it in and perhaps finish setting the lower sail, called the foresail. Slowing down meant capture. On deck remarkable detail tells a further story. The slaves are being taken out of the hold and sat down underneath the windward rail. In the War of 1812, sailors learned the value of getting the large crew of a privateer to sit to windward to improve stability and increase speed. It’s done today in racing sailboats large and small. Bringing the slaves out of the hold would also make it easy to throw them overboard, something not uncommon when a slave ship was in danger of being captured. Further careful examination shows some of the slaver's crew to be African. The slaver has the raked masts and the sizable rig developed in Baltimore privateers in the War of 1812. The type continued to be built in Baltimore, in the decades after the war, for owners who needed speed--including some slave traders, although these were carefully masked to avoid the law. The style spread to other countries where small, fast ships were needed. This brig has a figurehead, possible a witch, something that may lead to identifying the ship. Slavery was a horrible business, whose façade was often beautiful ships. Slave trade profits brought beauty and luxury to its practitioners, misery and death to its victims. Did this slaver escape? Was she captured, perhaps to be turned against its fellow slavers like many of her fellows?